During the February Half Term, we visited some fantastic attractions, the majority of which have been indoors, and so we were keen to get out and about, and enjoy an outdoor adventure as well. 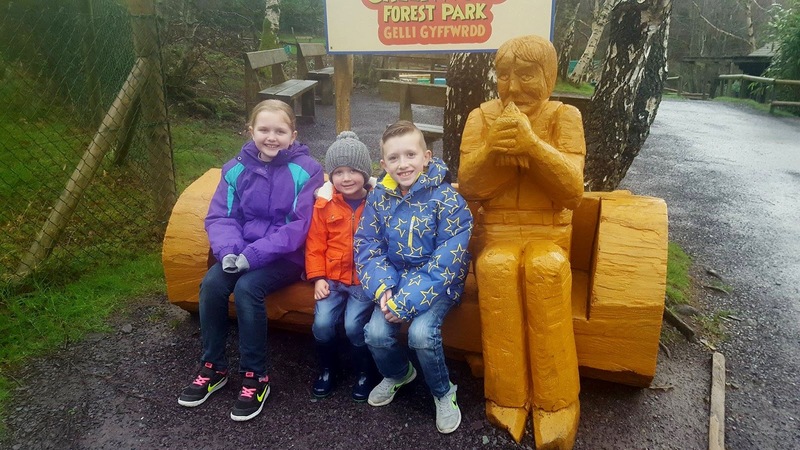 We were therefore delighted to have the opportunity to visit the wonderful Greenwood Forest Park located near Caernarfon in North Wales. 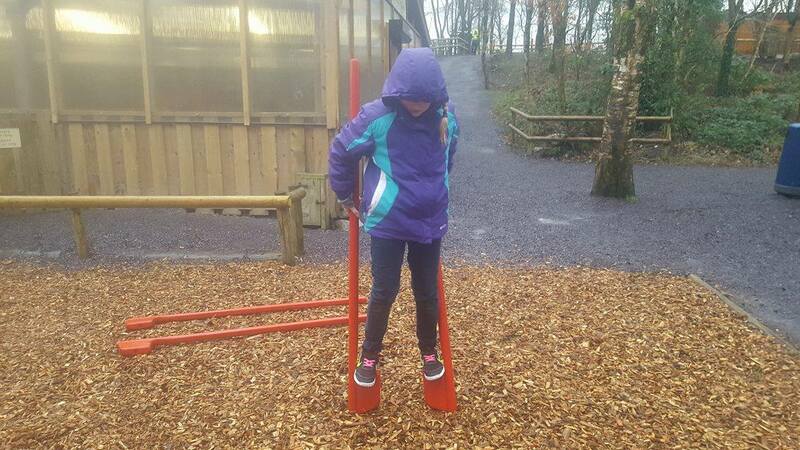 We have visited Greenwood Forest Park in the past, approximately 3-4 years ago, and so we were keen to see what changes had taken place and whether it was still as great as we remembered. On our last visit the children were much younger, and Riley was a baby, so the kids didn't have much recollection of their last time here, which made it all the more exciting for them. The attraction is well signposted from the A55 expressway and easy to find. The last couple of minutes of the journey is down a country lane, but there are plenty of passing spots for when you meet oncoming traffic, so this is nothing to worry about. There are two car parks which both offer free parking, one being located across the road from the attraction which is the largest of the two, and the other one is nearer to the entrance which is where you can find disabled parking, coach parking, and some spaces for cars. Due to the attraction being quiet at the time we visited, we parked in the nearer car park with ease. A short walk finds you at the entrance to the attraction, where there are some ticket booths to pay for entry. Admission prices vary dependent on whether it is low, mid or high season, however all prices offer extremely good value for money, as there is plenty to see and do. I would recommend checking the current season on their website, as during low season some attractions may not be available or will operate on a rotation system, and so if you want to check what is available before travelling, then their website provides you with all the information you need as well as a list of any daily events or shows that are taking place. 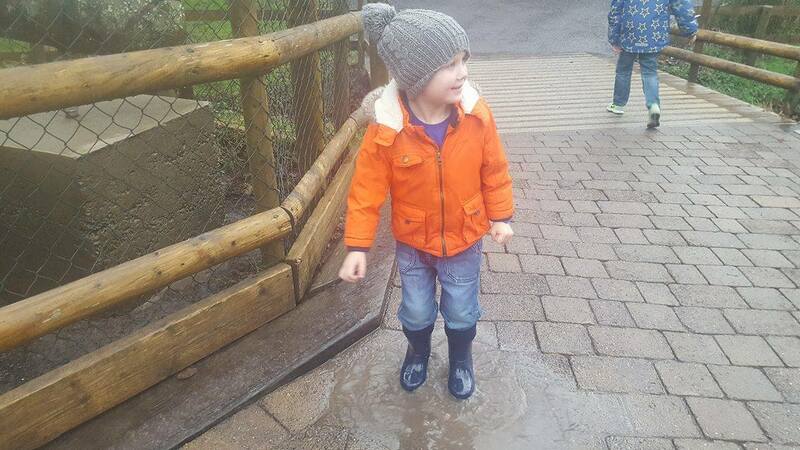 (Please note that the park is not fully open until 18th March). During February Half Term the admission price was £8.95 for adults and £8.65 for children aged 3-15 with under 3's entering free of charge. 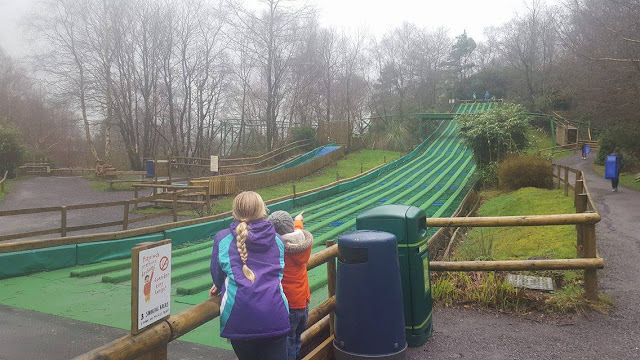 Although the two main attractions of the Green Dragon Rollercoaster, and the Solar Splash were closed, this still represented excellent value for money and at the same price as a cinema ticket, it is a bargain for the outdoor fun that was on offer. Unfortunately the weather was not on our side the day that we visited, with intermittent rain that was very heavy at times, however there was still lots to do, and as we had waterproofs and wellies with us, the rain was certainly not going to stop our fun. There was a large indoor play area within the cafe, and another undercover soft play area for little ones in the playbarn by the stilt walking area, and so we utilised both these places when the rain got too heavy. 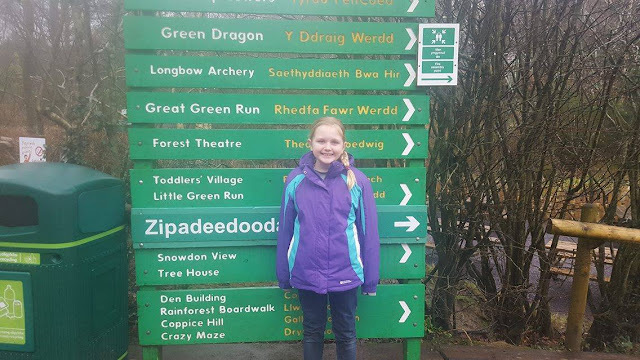 As we first started walking through the park, we spotted the tracks for the Green Dragon Rollercoaster and could see the track circle looping round above the trees. This wasn't open during our visit, however I do remember riding on this a few years ago and how much fun it was. It is a really clever design in that the rollercoaster is people powered! The track is 250 metres long and can carry 20 people between it's 5 carts, it is fast, but not too fast, so suitable for younger children too, providing that they are above 97cm in height. 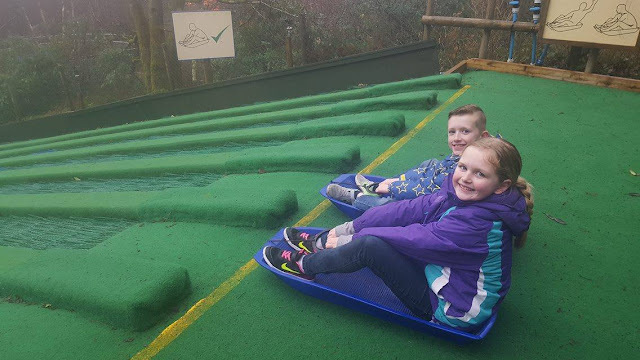 The first ride we made our way to was The Great Green Run which is a fantastic 70 metre sledge run that my children absolutely loved and wanted to go on again and again. You collect the sledges at the bottom of hill and make your way up the steps to the top, where you then set off on a fast downhill journey that is full of fun. Adults can join in too, so it is great to have something that us big kids can enjoy as well! 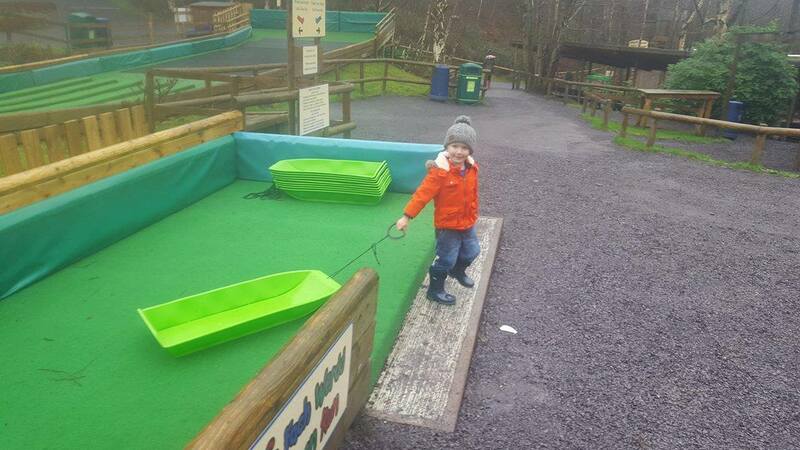 At the side of the large Great Green Run, is a much smaller one on a gentle slope for younger children. My four year old son Riley was a bit nervous at first, but once he had gone down it once, he loved it, and we returned to this part of the park several times during our day. 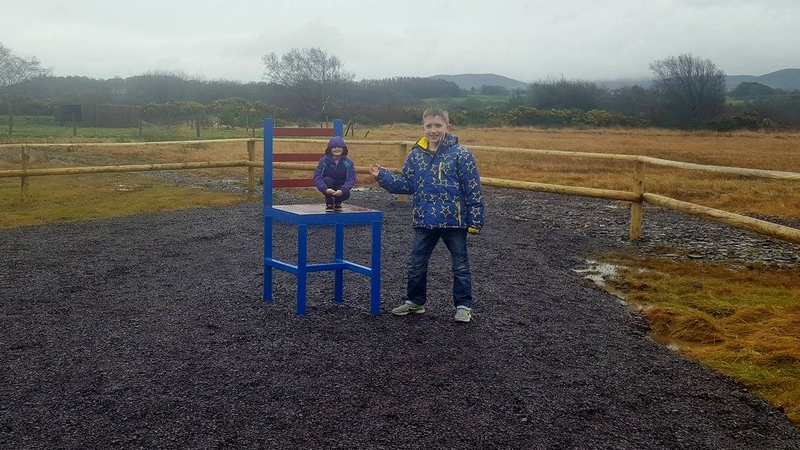 It was also nice to see that there was ample benches for parents or guardians to sit on whilst waiting and watching their children have fun. It is always nice to have somewhere to rest your legs for a few minutes. After the Great Green Run we made our way up to the den building area. 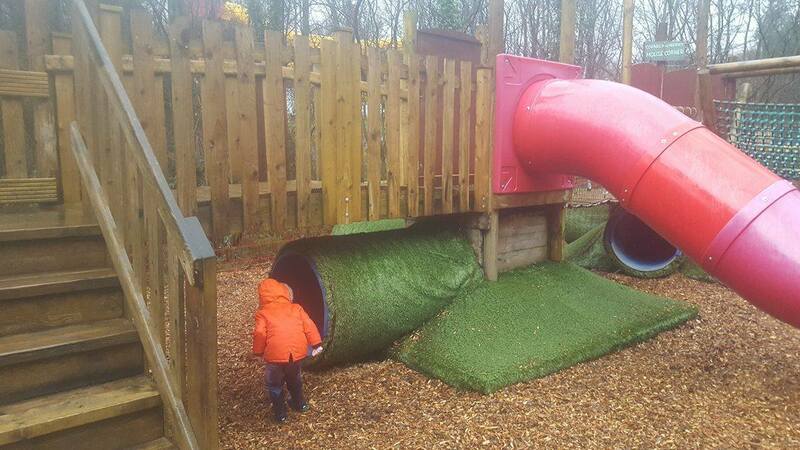 This is a great example of traditional outdoor play as lets face it, who doesn't like making a den? There is a large range of sticks that you can get together to make your own little hut and see if you can all fit in. It is also in a sheltered area and so even though it was raining, the weather didn't affect us too much at all. Adjacent to the den building area is also a wonderful look out point, where we could see the whole of the park. I would imagine that on a clear day that this also offers some wonderful views towards Snowdonia, but sadly the cloud was not going to allow us that amazing view during our visit. 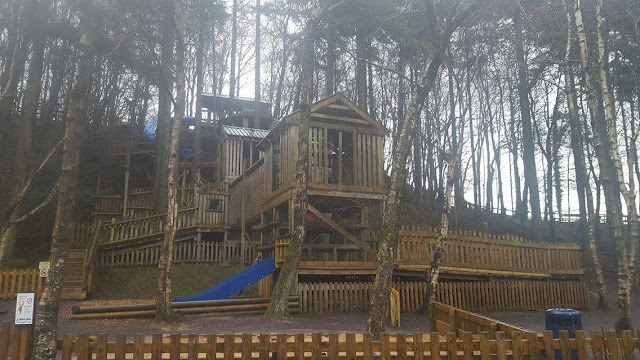 Whilst at the lookout point, my children quickly noticed the extremely large play area to the left of them, and so it wasn't long before we had worked our way back down the hill and to the amazing woodland park. The play area is constructed out of wood, and is built into the hill and woodland. As you can see from my pictures it is absolutely huge and my children were in their element. The larger play area also has a sand pit at the bottom where you can sit and play, and again there were places for parents to sit and have a rest. The play area also features some fantastic long slides, and Emma and Ben enjoyed running up and sliding back down. 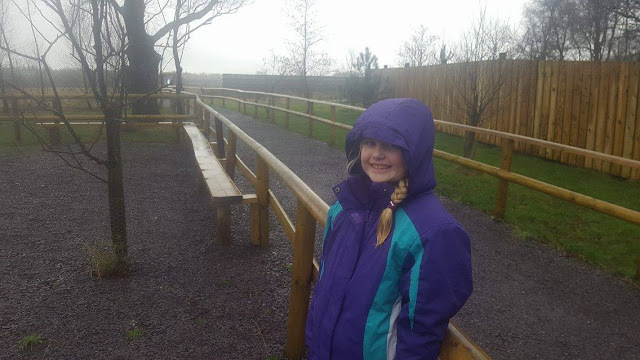 As it was raining at the time, the play area was really quiet, so they loved the fact that they had this huge wooden adventure zone all to themselves. 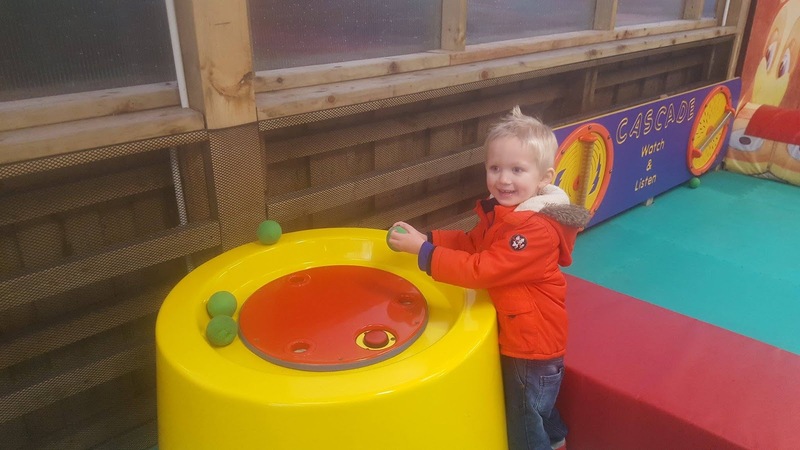 Riley was a bit overwhelmed by the size of the larger play area, and so he opted for the smaller play area that is designed for younger children. This play area was lovely and bright with seating around the side. There was a range of tunnels, slides, and climbing areas, and he absolutely loved playing hide and seek in there whilst I ran around trying to find him. His laugh kept giving away his hiding place though! In between the two play areas is a picnic area with ample picnic benches which must be lovely in the spring and summer months to enjoy some al fresco dining. There were plenty of bins for rubbish, and also some vending machines for drinks. More and more attractions nowadays seem to be preventing customers from taking their own food with them, and so it was nice to see that this is encouraged at Greenwood Forest Park, and throughout the day we came across numerous other picnic areas. If you don't fancy a picnic though, Greenwood Forest Park have several huts around the park selling snacks and drinks during peak times, as well as an indoor dining option called the Green Oak cafe if you fancy a hot bite to eat. The cafe is open both in the main season and in the winter. 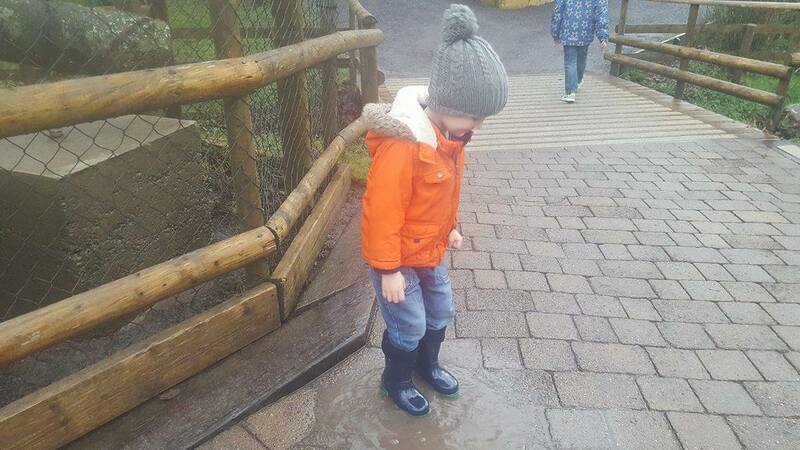 As it got nearer to lunch time we experienced some really heavy rain, the kind that is so heavy it actually hurts, and so we moved indoors to the indoor soft play area for toddlers for Riley to play for a while, whilst Emma, Ben and Mr F, went and queued for the Archery which was also undercover. 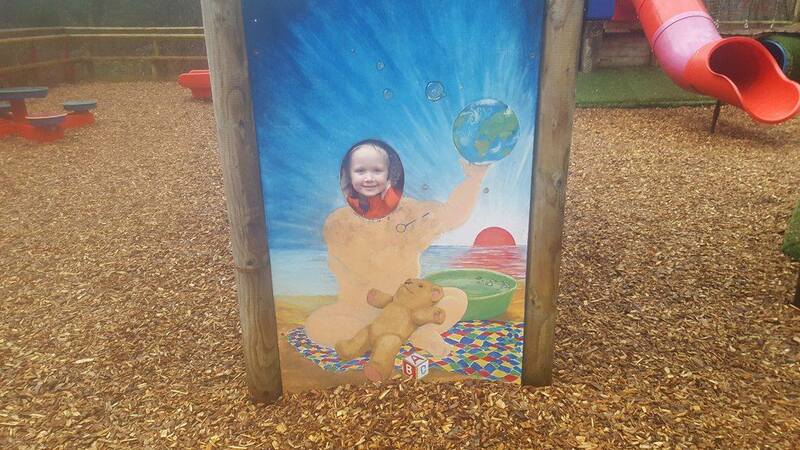 The Little Forest Playbarn was absolutely fantastic. 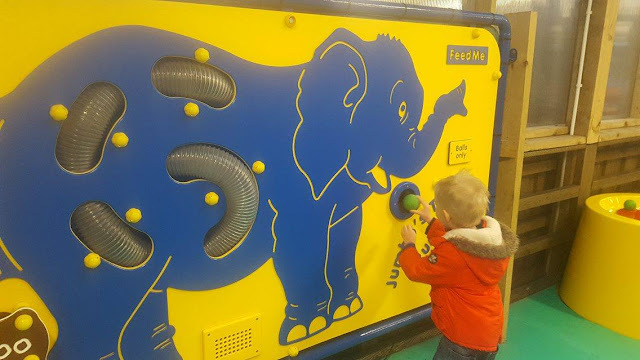 It featured a wide range of soft play activities, as well as two sensory areas, a fun elephant ball machine, and a ball blower. The area was well padded and Riley enjoyed running around, collecting the balls and putting them in the elephants mouth and watching them come out the other end! He also enjoyed climbing and sliding within the play area, along with pressing all the animal sounds on one of the sensory walls. Like the earlier outdoor play area, there was a nice selection of seating as well as tables so it could also be used as an indoor picnic spot. Once the rain had eased, we made our way up the small hill towards the Solar Splash ride. This was closed during our visit, however we had spotted it whilst in the den building area and wanted to take a closer look. It looked huge from a distance, and appearances weren't deceiving. This giant solar powered water slide looks amazing, and stands at 12 metres high and 60 metres in length. 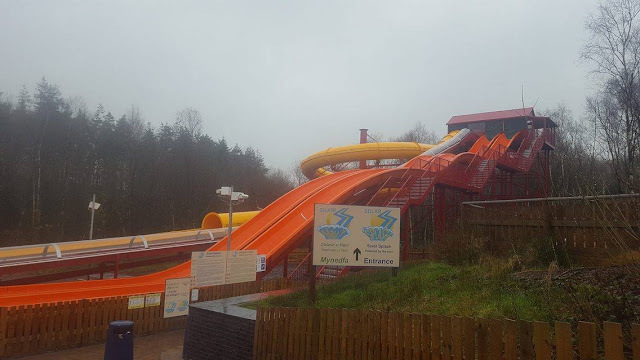 The Solar Splash features a spiral tube chute, along with two wave chutes which all look great fun and something we will definitely be hoping to try out in the summer. Whilst I was admiring the Solar Splash, Emma and Ben decided to climb the Wild Web which is located just beside it. This is a 6 metre tall rope pyramid, which provides the challenge of being able to tackle the web and climb to the top. 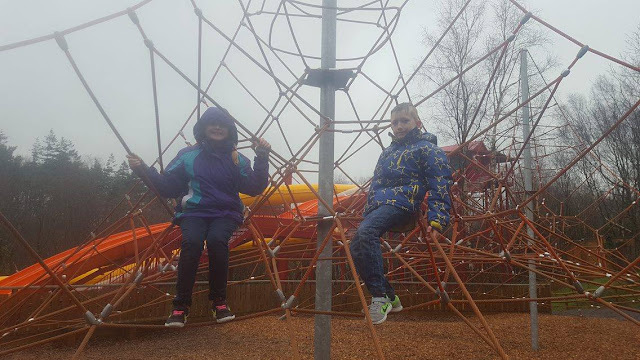 Both Emma and Ben managed to climb to the top of this relatively easily, however the biggest struggle was getting back down, which took them much longer, and was more of a challenge. They both really enjoyed this and ended up turning it into a race to get to the top and down again. We then followed the walkway to Rabbit Village, where there were some gorgeous rabbits, all in large sheltered enclosures. They were all so beautiful and at 2:30pm every day you can have the chance to meet them and get up close with these lovely animals. Opposite Rabbit Village there was also a large aviary, that was home to some chirpy colourful budgies! As it had began to rain heavy (again) we made our way back to the cafe, and decided to have a hot drink whilst waiting for the rain to pass. 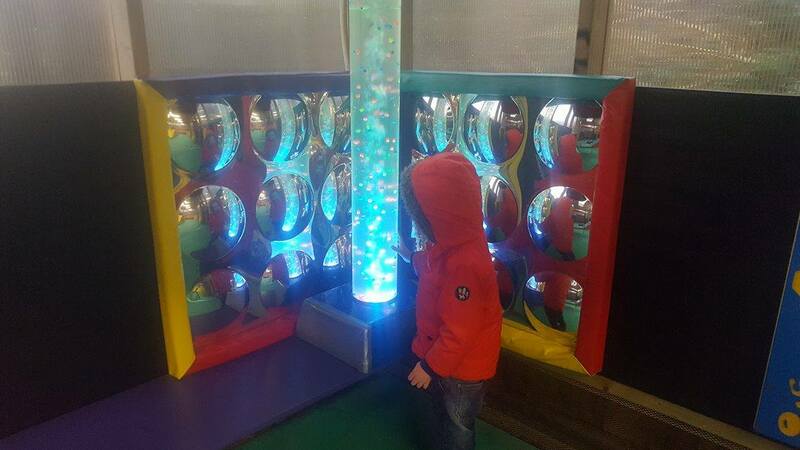 The cafe area is also home to a large indoor play area suitable for older children, and a smaller area for the younger children, enabling parents to relax with a drink, whilst knowing the children can play safe nearby. We had hot chocolates and cappuchinos which were both delicious, and the service was great. We opted to sit in the quieter conservatory area so that we could look outside, and we found this area to be very clean and comfortable. A member of staff regularly came round to check for any tables that needed clearing and so it was nice to see that this was kept on top of. Luckily the heavy rain soon stopped, and the remainder of our day at Greenwood stayed dry. After we had finished our drinks and the children had enjoyed the soft play area, we made our way back past the Rabbit Village towards the Jungle Boats. This was lots of fun, and involved working together to make our way around the river using the over hanging ropes and one oar. We struggled at the beginning to get the hang of using the oar, as my daughter wasn't quite sure what to do, but it wasn't long before we were on our way and making our way through the Jungle forest. This is a great activity to do as a family and encourages you to work as a team to make your way around without getting stuck! Next up was the Moon Karts, which are pedal powered karts that you can steer round the track. I loved the fact that some of these were two seaters, as it meant that Emma was able to ride round with Riley, who wouldn't have been able to have managed it on his own. The seats are adjustable and adults are welcome to ride on them too. It was funny watching everyone speed down the down hill part, to then realise that they then had to pedal back up on the opposite side. Certainly a great form of exercise! Located near to the Moon Karts is the Barefoot Trail. Here you can remove your shoes and socks and experience walking barefoot over different terrains such as sand, straw and water. 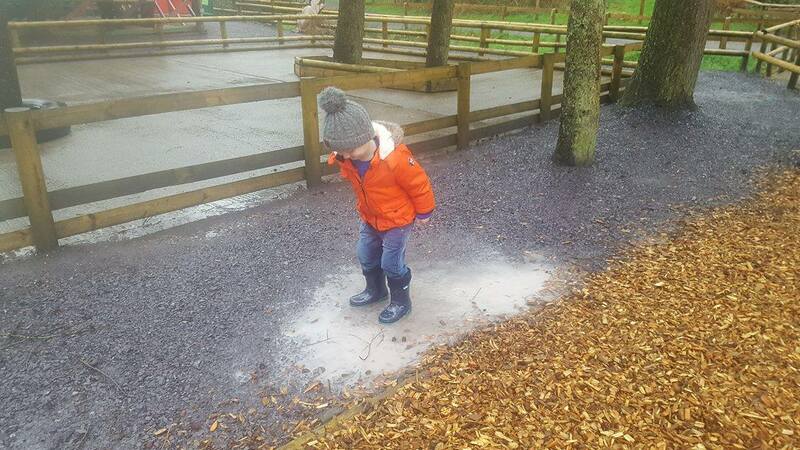 Don't worry about getting your feet dirty though, as taps are provided to give them a clean afterwards, so you can kick off your shoes and enjoy a fun sensory experience. 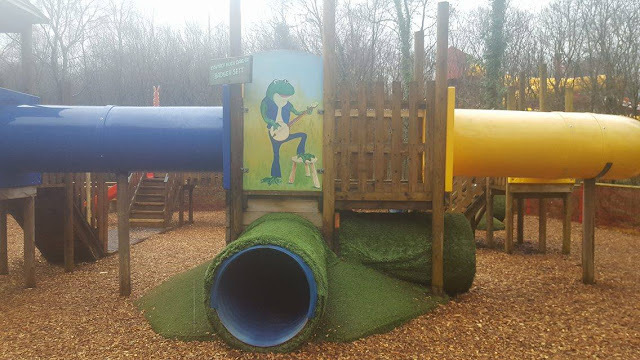 Whilst your shoes are off (and once you've cleaned your feet of course) you can also head over to the Giant Jumper which is basically a huge bouncing pillow that you can jump up and down on. 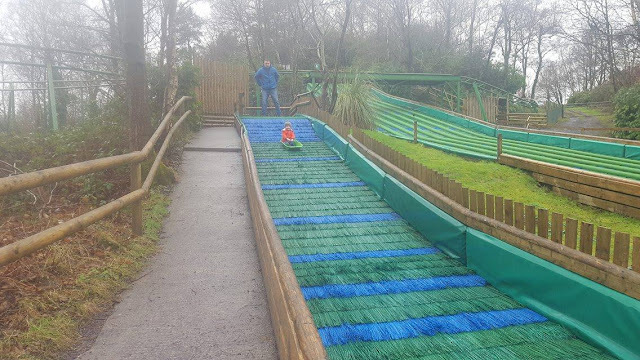 Due to the rain, this would have been extremely slippy, and so it was closed during our visit, but it looks great fun, and is something we will try on our next visit. 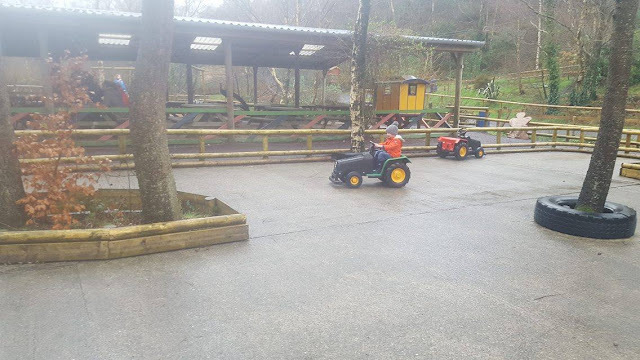 Once the children had ridden on the moon karts again, Riley wanted to return to the Play Barn area, as he had previously spotted some tractors located outside it. This is an extra payable ride as it is coin operated, but at only £1 it certainly doesn't break the bank, and lasts quite a while. Riley really enjoyed navigating himself around the other vehicles and the trees, and I was proud of how well he actually did. He certainly got the hang of it pretty quickly. As you can see in the background, there was another large undercover picnic area here, and we were very impressed by just how much seating and picnic benches there were around the park. Whilst Riley had another go on the tractors, Emma gave stilt walking a go. She was a little unsteady at first, but stuck at it, and eventually managed to balance well enough to walk on them. I really liked the fact that in each area, there seemed to be something for all age groups, so instead of any children getting bored waiting for their siblings or friends, there is always something else to do nearby. Greenwood Forest Park have clearly put a lot of thought into the layout of the park, and I personally feels that this works really well. After a bit more puddle jumping, Riley decided that he would like to have a go at archery, like Emma and Ben had done earlier. 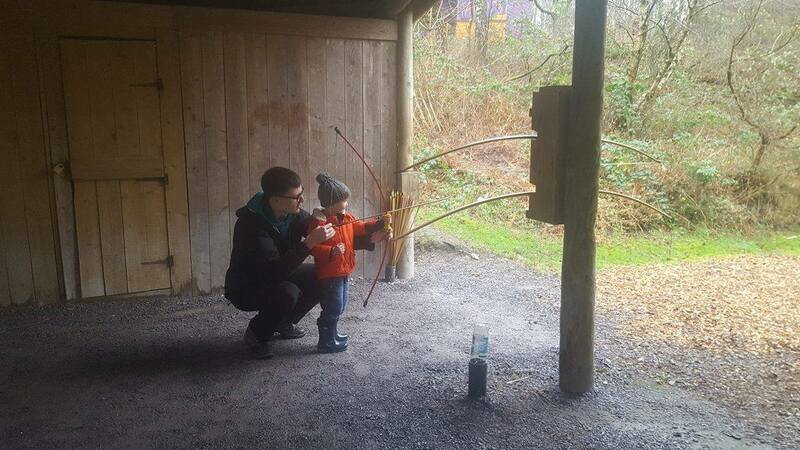 I thought that he may have been too young, but the friendly staff member working on the archery range, said that he could have a go with his assistance. 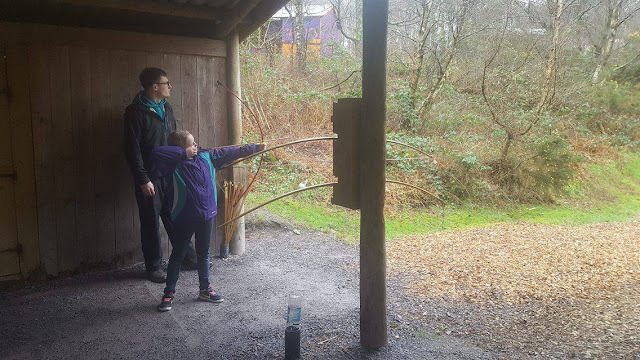 Of course with the young man helping, Riley managed to fire a bow and hit the target, which gave him a huge confidence boost and made him feel very proud of himself. I was pleased that despite there being other people waiting in the queue, the employee took the time to help Riley and didn't rush him at all. It was also nice when everyone in the queue also joined in and cheered when he hit the target. Emma on the other hand, has tried archery several times previously, so was quite happy to give it a go without any assistance, and did really well. Just before we were about to leave, I remembered about a post on Twitter I had seen regarding a magic chair. I hadn't seen this on my way around the park, so we quickly pulled out our pocket size map and found where it was located. I am so pleased we did, as we had so much fun taking our photos and had a really good giggle. I had spent a bit of time trying to figure out how it is done and so I was amazed when I saw it and actually realised how easy it is. ( I won't spoil the secret of how you do it!) It really is a great optical illusion and there are no computers, or photo editing involved. 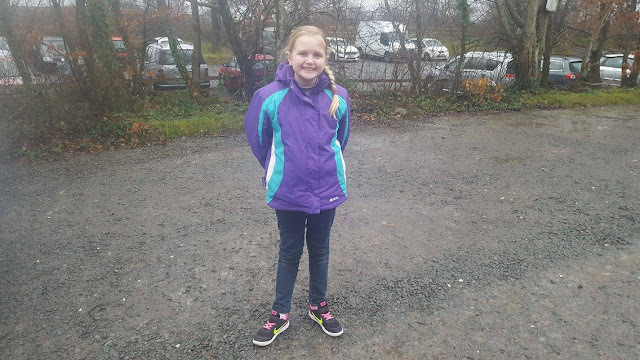 Prior to leaving we visited the shop, as the children had some pocket money left over from the weekend to spend, and I was very surprised to find such a wide range of pocket money priced items. The shop was full of items, gifts and toys to suit all budgets, and you can also find a cash machine in here too that offers free withdrawals which is always handy. 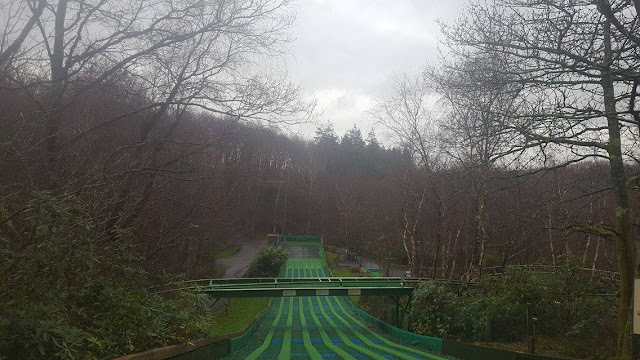 Overall, we had an absolutely fantastic time, and if you are looking for an outdoor adventure packed with lots of fun, then I literally cannot recommend this place highly enough. We had a brilliant time on what was a wet and rainy day, and so I cannot wait to see how much fun we have when we return in the summer. 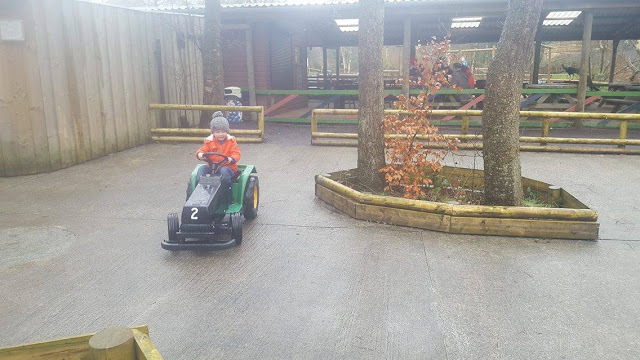 The entry prices offer excellent value for money, and there is something for everyone on the park, including adults, so there will definitely be no boredom setting in here. During peak season there are also a variety of shows on during the day featuring entertainers, clowns and magicians, so even if you don't fancy joining in on the adventurous side of things, there will still be something to keep you entertained. We will definitely be returning! Disclaimer: We were provided with complimentary admission for the purpose of providing an honest and impartial review. All opinions and photographs are my own. Entry prices and opening times when mentioned are correct at time of writing. These may be subject to change so would always recommend visiting the attraction's website prior to visiting.